How two U.S. entrepreneurs are selling Chinese fashion to the post-Tiananmen generation. Tor Petersen and Renee Hartmann in their Shanghai flagship store. Eno's retail marketing team at company headquarters in Shanghai. 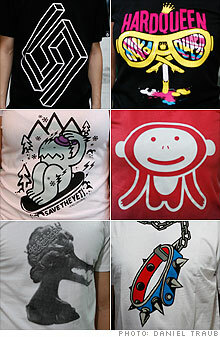 Chinese designers create and pitch Eno's t-shirts. "It's also democratic," says one. Chinese businesses, their coffers overflowing with state money, have been doing progressively bigger and bolder deals. BEIJING (Fortune Small Business) -- It's a hot august afternoon in Beijing, and student Li Yanan is shopping with a friend at the Joy City mall, in the city's Xicheng district. The mall offers plenty of Western brand-name stores -- Quiksilver, Levi's, French Connection -- all looking much as they do in other malls around the world. But Li, 20, is drawn to the only store displaying a large slogan printed in Chinese characters. YOUR OWN STYLE, it reads. Within seconds, Li is inside trying on a garish pink trucker's hat. The chain, called Eno, is almost as unusual as the headgear. Founded by transplanted American entrepreneurs Renee Hartmann and Tor Petersen in 2006, it is one of the first brand-name retailers to sell hip, urban streetwear designed by and for young Chinese. That makes it stand out in a market dominated by foreign brands and local manufacturers that specialize in copying them. "We wanted to create a brand focused 100% on China," Hartmann says. Both she and Petersen saw a sea change in the world's most populous country -- the rise of a generation of young adults who wanted to stand out rather than blend in. Like Li, they weren't born at the time of the Tiananmen Square student uprising in June 1989 -- or are too young to remember it. Deng Xiaoping is a distant memory. China has been more capitalist than communist for most of their lives. Today's Chinese 15- to 24-year-olds -- over 220 million of them -- also have a lot more money to spend than their parents ever did. Adjusted for inflation, the annual per capita disposable income of city dwellers rose by an average of 7.2% a year between 1978 and 2007, according to China's National Bureau of Statistics. In 2008 it was more than 15,700 yuan (about $2,300). And even in a down economy this generation remains eager to spend. Li's parents both work for a logistics services firm and give her an allowance that funds all of her purchases. "Our parents always wanted to save money, to have a steady, boring life," Li says through a translator. "We have more options." It's one thing to see this kind of change happening all around you; it's another to cash in on it. Hartmann and Petersen had no experience in fashion design. Petersen, 40, is a tall Yankee with a shaved head who speaks fluent Mandarin and spent eight years as a manufacturing and marketing executive for Nike (NKE, Fortune 500) China. Hartmann, 34, was an investor relations consultant who worked with companies going public in the U.S. and Hong Kong. They met when Petersen was scouting for a CFO with knowledge of Chinese business law to join Eno during its incubation period; Hartmann fit the bill. Over the course of 2005, the outspoken pair convinced each other they could tap China's budding creative community to generate winning, youth-friendly designs. So far their strategy seems to be working. Three years after its launch, Eno boasts 60 employees (including five designers), six stores, three franchises and shelf space in more than 20 department stores across China. In 2008 sales topped $1 million -- or 430 times the average disposable income. The company says its revenues are set to double this year, and it expects to turn a small profit. To stay profitable and compete with a growing number of homegrown urban fashion brands in China, Eno must perfect its ability to read the rapidly changing tastes of Chinese youth. And that may be tough for a company that doesn't have a designer at the helm. From the beginning Eno was an unlikely enterprise that took its fair share of missteps. Initially conceived as a sportswear brand, Eno was born at Zou Marketing, a Shanghai boutique that Petersen and two other Nike China veterans founded to market sports brands and events. But it soon became clear that China's sportswear market was already oversaturated by Nike and Adidas, as well as such Chinese brands as Li Ning and Anta. So Petersen and Hartmann turned their attention to the nascent streetwear industry. "Five years ago there wasn't one," recalls Zou Marketing co-founder Terry Rhoads. 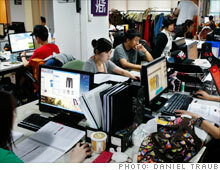 What if they could create China's answer to Urban Outfitters (URBN)? With a $5 million investment from Shanghai venture capital firm Chengwei Ventures, Hartmann and Petersen decided to start with the low-hanging fruit of the fashion world: T-shirts. They quickly established three sources for Eno's designs: collaborations with local artists and musicians, online competitions in which users would submit designs and vote their favorite T-shirt graphics into production, and an internal design team. At first Petersen was responsible for directing his staff designers. He would announce a brief or theme and work closely with the creative team to refine their designs into something that satisfied his tastes. But by April this year, he had to admit that it wasn't working: The designers were struggling to meet the briefs he came up with. Some of his culture-specific themes, such as "preppy" or "Mardi Gras," tended to get lost in translation. And Eno's customers seemed less than thrilled by the results. "We were losing the passion of our designers in the process," says Petersen. "It felt like I was forcing a brief down their throats." So Petersen made the designers responsible for coming up with concepts and pitching them to him. His creative role would become more hands-off, which the two founders soon realized was a logical step. "After all," Hartmann points out drily, "we're not Chinese kids." The first collection to emerge from this new system was Eno Classic, a series of T-shirts and hooded sweatshirts adorned with variations on an abstract logo created by 27-year-old designer Feng Feng. Two weeks after the collection hit stores, Petersen says, those designs were selling far better than discounted items from Eno's spring collection, which included a tube dress adorned with the mangled English "Not so enocent" and a T-shirt that sprinkled beads and sequins around the word Celebrate! Eno found a breakout hit with a series of environmentally themed shirts. The design used the Chinese character for forest, which consists of the character for tree written three times. "It was like three trees make a forest, the idea being that you just have to do a little bit and you can make a difference," Hartmann says. The design went against everything Hartmann thought she knew about Chinese fashion preferences. "The conventional wisdom here is that Chinese people don't like having Chinese characters on their T-shirts, that they only like English," Hartmann says. "But that T-shirt sold like crazy no matter what color we put it in. We didn't expect that." The bottom-up approach is appreciated by designers like Feng, who had previously worked at two smaller streetwear brands in Shenzhen and Shanghai. "Eno provides a wider platform for designers to do what they want to do," Feng says through a translator. "It's almost democratic." That wasn't the only way Petersen and Hartmann strove to get closer to their customer. In manufacturing they took their lead from so-called "fast fashion" retailers such as H&M and Zara, which emphasize bringing new designs to market as rapidly as possible. Both companies recently opened stores in China. Like its larger rivals, Eno is developing a supply chain that will allow it to get small batches of new designs out quickly. The company already uses recent sales data to reorder popular styles on a weekly basis. "You allow the consumer to tell you which products are working," Petersen says. 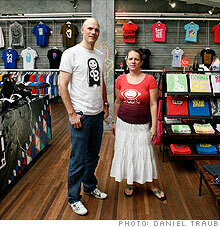 Currently, Eno can take a T-shirt design from concept to store floor in three weeks. Reordered styles usually reach the store within a week. To manage these quick turnarounds, Eno turns to small factories within a few hours' drive of Shanghai, which also helps keep inventory levels low. Mixing fashion with music is hardly a new idea in the U.S., but the concept is still quite fresh in China. "I don't think there's been anything like this," says Brad Ferguson, the manager of local pop-rock group Hard Queen, which has played five gigs at the store in the past two years. "The shows that audiences have enjoyed the most have been at Eno." For a startup with little cash to spend on advertising, those events -- along with T-shirts featuring designs created by the bands themselves -- have become a valuable marketing channel. Petersen typically gives each act a batch of free T-shirts, which the band then sells to fans. In return, Eno gets to put its logo on all band flyers and posters. The local art, music and fashion scenes owe much to the dramatic surge in Internet access in China over the past decade. Fewer than 1.2 million users were online in 1998, according to the government's China Internet Network Information Center. By June 2009, that number had surpassed 330 million. Despite the government's extensive efforts to censor potentially subversive online content, a lot of cultural information has filtered through, and the impact has been tremendous. "Ten years ago everyone looked the same here," says Alexis Yang, 26, Eno's events organizer, who sports an oversize woolen hat in Rastafarian colors. "There was no punk or hip-hop in China except for really underground stuff, and no way to express your personality." 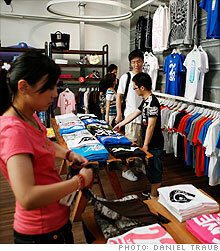 Nowadays, new streetwear fashions pour into China from South Korea, Japan, Europe and the U.S. But Hartmann and Petersen have learned that Chinese fashion trends tend not to follow the global model. "Everywhere else, fashion starts from the runway, and you pretty much know what the trend's going to be a year or two later," says Hartmann. "Here it's not really clear what's going to end up working at what time. That's why we tried to open up the design process as much as possible." The unpredictability of China's new youth market explains why Eno's biggest fear is other homegrown brands. The Thing, for example, is a Shanghai company founded four years ago by Zheng Zhu and Zheng Yi, two brothers in their early thirties. Unlike Eno, the Zhengs didn't receive any outside funding, starting the company with about $400 of their own money. Today, thanks to the work of chief designer Yi, The Thing has grown to six stores in Beijing and Shanghai, at least two of them located just steps from an Eno branch. "China is catching up very quickly with the international fashion market, and competition is fierce," says Sandy Chen, research director at the Shanghai office of TNS China, a market research firm. "Eno has established one of the leading indie brands, but it will have to be very sensitive to what's in, what's cool, and it will have to run the business very efficiently." Petersen and Hartmann hope to leapfrog the competition by turning Eno into a leaner enterprise, starting with their retail outlets, which they plan to hand over to franchisees. Eventually, they hope that Eno will find an international market. "Sooner or later, people in other countries will want to see original Chinese design," Hartmann says. "We're a good platform for that." Meanwhile, Eno is growing another revenue stream through a separate consulting business, Enovate. Launched earlier this year with five employees, Enovate has already been hired by the likes of Ticketmaster (TKTM) and shoemaker New Balance to provide youth market research, as well as to help design and develop products for the Chinese market. Not bad for a company that has grown by trial and error. Back at Eno's store in the Joy City mall, a 20-year-old business student named Wang Meng is being forced to try on some jeans and a T-shirt by his girlfriend, Qiang Yi Na. Disconcertingly for the Eno staff, he walks out empty-handed. "It's not my style," says Wang, who sports a polo shirt and slacks. Still, Wang is giddily appreciative of the buying opportunities available to his generation of consumers. "We're rich," he says with a grin, adding that both his parents grew up in a rural town, wearing hand-me-downs made by his grandparents. Wang says he spends some 200 yuan a month (about $30) on clothes, funded by a parental allowance as well as profits from buying and selling shoes online, a small business that he runs from his university dorm. Pondering the racks of clothes around him, he offers: "This is better than my parents' life."